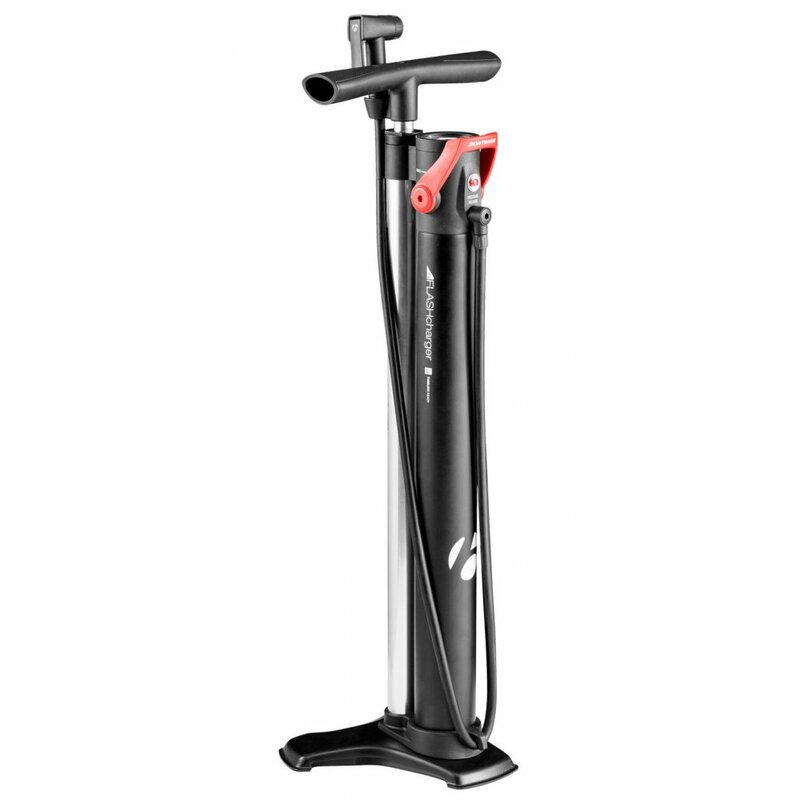 The Bontrager Flash Charger Tubeless Ready track pump is a fast and simple pump making it “easier” to pump tubeless ready tyre set ups. The pump is high quality and has a heavy solid feel to it, when I say heavy, I mean HEAVY. The Handle is a comfortable shape and there is no appreciable flex in it pumping up to 160psi (and beyond). The effort did increase quite a bit with the pressure over 100psi, the pump feels secure and consistent all the way to 160 psi. 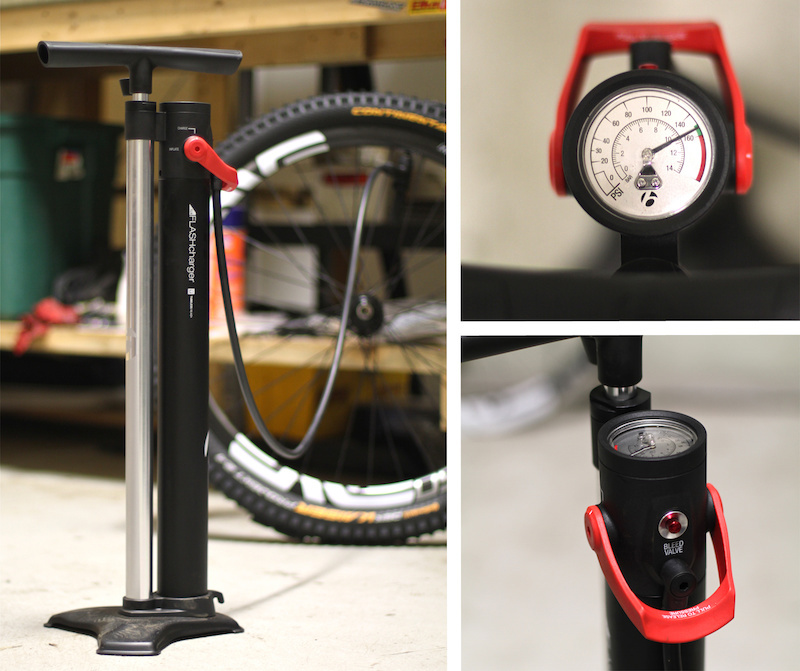 The Pump works through two different chambers, one pumping system pumps air into the larger barrel which is stored and once you need to inflate your tubeless tyre you can do it in a flick of a leaver. The 160 psi charge sealed up a huge 29er tire to about 22 psi. And since the air chamber balances out with the tire pressure right away, one can just continue on pumping to further seal the tire or get to the desired pressure. A full charge in the pump is achieved in about 45 strokes. It is also a great pump for non-tubeless tires and it also works with both Presta and Schrader valve types through its “Smart Head”, this is a nice touch as tyre sealant can spray back out of the valve into the pump head and this single smart valve clears easily with a couple of pumps. The flexible pipe is also quite long so making it easy to pump up tyres on a workbench or on a work stand. The pressure gauge is on the top of the barrel making it easy to see. I chose to try this pump as an alternative to a conventional track pump, the standard track pump could seldom seal a tyre on to the rim even using lots of washing up liquid and water without giving you a serious work out. To combat that I was using CO2 gas canisters, and although that works well, and most of the time it gets the job done first time, it is expensive, especially if you need to change the tyre or can’t top up the sealant via the valve, or worse yet do not get a good seal on the rim and lose too much pressure before you can get the track pump on to seal it properly. So what do I think about this pump? I think I would give it a 7/10. On the plus side it has a large volume chamber that can charge your tyre to between 20 and 30 psi depending on diameter of tyre and wheel size. It allows a simple transfer from “flash charge” to continuous pumping. It has a simple smart valve that locks on securely. On the negative side, it is expensive £80 - £100, the “flash charge” is not nearly as instant as the name suggests, and is much slower than a gas canister……this may be a good thing or a bad thing depending on your point of view. Here are a couple of links to other people reviewing the pump, you can see the effort required and the results achieved. My 3 year relationship with cheep Chinese £20 eBay lights is over. I drained the bank account on a Lumicycle Explorer 2016 Extender Pack. Yes I have gone for probably one of the most expensive lights, but I would rather that than hit a tree, a stump or a root and end up with another broken bone. My buying criteria was not so much price but mainly life of battery, ease of fitting / removing at the pub and great illumination on the trails. 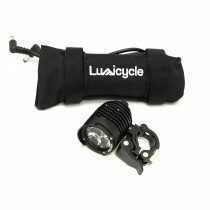 My research was finding out from others in CAMMTB which make of lights were considered "the best" and then checking out the tech specs on each manufactures website. 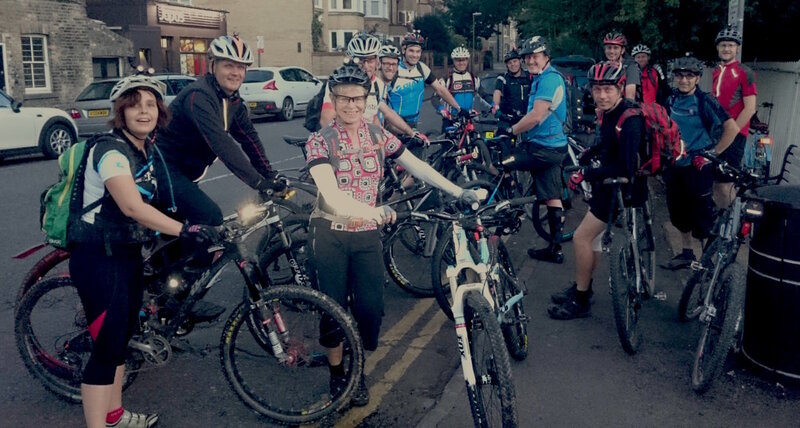 The battery life on most let them down, two hours seemed to be the norm at about 3000 lumens which would mean on a typical CAMMTB ride I would run out of juice or have to spend most of the ride turning up and down to conserve the battery. Lumicycle Explorer Extender Pack ticked all the boxes. 2200 lumens medium mode is still amazingly bright and is perfect for the less technical trails. This mode gives an incredible 7 hours run time. Maximum boost mode gives 3500 lumens, which is practically like daylight. You can flick the switch and it will give you this mode for 3 minutes or flick / hold to give permanent boost mode. Between modes the lamp ramps up and down gradually, letting your eyes adjust to the change. Lamp is mounted on the bars with a quick realise clamp which hold the lamp like glue. Even over the rough stuff the lamp does not move. Lamp is controlled by a neat toggle switch so just a quick flick up and down is all that is needed. Extended battery is small and fits to the frame with a bag / velcro straps. I was dubious about this but it is neat and secure. Lastly I would like to say that I am in awe at the battery life. Reading the blurb that came in the box, it says for the first two battery charges, discharge fully then recharge fully to condition the battery. After using them for a couple of hours on Tuesday night on high and boost power, I thought that it would only take say an hour or so to totally discharge the battery. So yesterday lunchtime I turned them onto high and left them on my desk. Come 11.30 last night they were still on, and still on high power so I went to bed ! Frame Wax – before I put my bike together, I gave the frame a really good clean and put some touch-up paint on the chips. But because the frame was second-hand (thanks Duncan), there was some minor scratching that I needed to smarten up. 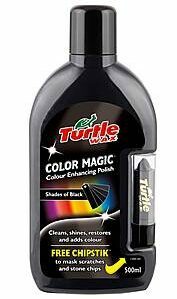 I had some Turtle Wax® Color Magic™ from when I owned a car of the same colour and it came with something called a Chipstik™. The (in this case black) Chipstik™ looks like Marilyn Manson’s lipstick. The idea is that you fill the scratches in by rubbing the wax repeatedly over them at 90 degrees to the direction of the scratch. You then buff-up the frame to remove any excess. The Color Magic™ works in the same way as it’s a liquid wax which you apply with a damp cloth, it fills up minor scratches, and you remove excess/buff it up to a shine with a nice, clean, dry cloth. Apart from giving the frame a renewed look (which it did), I found that there was a secondary benefit – mud doesn’t stick so well. The wax made it much easier to clean after a muddy ride. I’d read in an old MBR that finishing your bike off with some wax – even furniture polish – was recommended. It seems to work and I’m a convert. 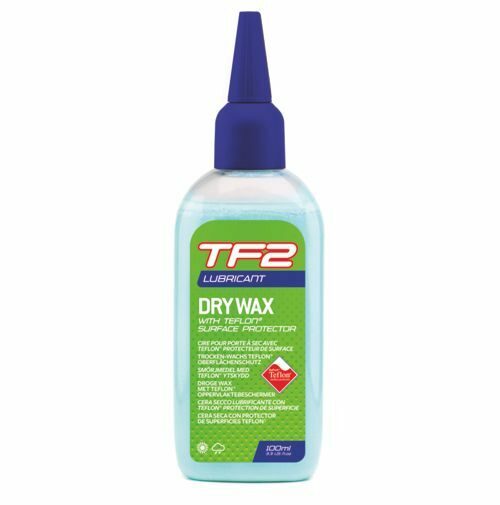 Chain Wax – I picked up a sample of some dry chain lube from the Weldtite stand at The Cycle Show, TF2 Ultra Dry Chain Wax with Teflon®. The idea is that you use this instead of normal chain lube and it is supposed to have excellent water resistant and dirt shedding properties. You do have to firstly clean your chain and completely degrease it, which might be a pain for some. You then apply the lube promptly, allowing it to ‘dry’ for a while before you use it. So far it’s been fine – my chain on my 29’er is a little old but the lube kept it moving smoothly and quietly with no problems, even in wet and muddy conditions. I’ve now cleaned the chain with Muc-Off and it needed a fresh application of the lube – the Muc-Off seemed to be good at removing it. I had seen this sort of dry-lube before (Finish Line Krytox), but really only for dry, summer use so the fact that this works in wet and muddy conditions is something new (to me, anyway).